Home field advantage? 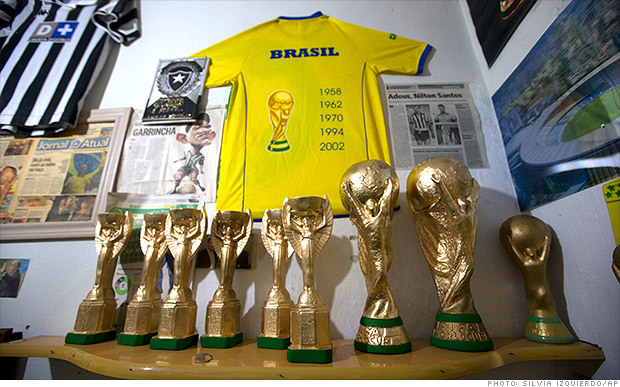 Brazil is Goldman's pick to win the World Cup. If you want to put money on the World Cup, Goldman Sachs has some advice for you. The Wall Street bank on Wednesday released a statistical model for predicting the outcome of the 2014 World Cup, which kicks off June 12 in Brazil. Based on a study of international soccer matches since 1960, the football/soccer fans at Goldman expect Brazil, Germany, Argentina and Spain to reach the semifinals. Brazil is the favorite to win the Cup, thanks to its home field advantage, according to the model. That could be good news for Brazilian stocks. Goldman found a link between a World Cup victory and the short-term performance of the stock market in the winning team's home country. It looked at the stock performance of winners going back to 1974. On average, the winning nation outperforms the global market by 3.5% in the first month following the World Cup. But the "trophy bounce" doesn't last. By the end of the year, stocks in the home country of a World Cup winner have, on average, underperformed by 4%. Brazilian stocks went into free fall during the first three months of the year. But the Bovespa index clawed back in April and May and is now up about 2% for the year. The Brazilian government has spent some $11 billion to prepare for the month-long series of 64 matches, though economists say the economic impact from the World Cup will be fleeting. Goldman said the pattern of stock market outperformance by World Cup winners is remarkably consistent, with one exception: Brazil won in 2002, but the nation's stock market plunged 19% as it grappled with a recession and a currency crisis. Meanwhile, Goldman found that stocks in the home country of a World Cup runner-up tend to take defeat badly. "The runners-up seem to experience a post-final bout of the blues," the report states. Most of the runner-up nations saw their stock markets underperform by 1.4% in the first month following the World Cup. There is one notable exception: Argentina was a runner up in 1990, yet the nation's stock market surged 33% in the month after its team was defeated by Germany. The Argentinean peso has plunged in value this year as the government devalues the nation's currency in a bid to jump start growth. While the benchmark Merval index is up 40% this year, Argentine stocks have lagged after adjusting for inflation. Goldman also found that stocks in the country that hosts the World Cup enjoy a nice bounce in the month following the event. But, as with the winners, the gains fade fast, with nearly half underperforming over three months. "The message seems to be: enjoy the gains while they last," the report states.